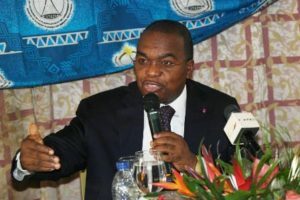 Cameroon will begin losing huge sums of custom revenue from August 4 when the Economic Partnership Agreement, EPA, goes into effect. The agreement that Cameroon signed with the European Union, EU, provides for the reciprocal dismantling of trade barriers. Economic analysts hold that by signing the agreement, Cameroon is in for economic suicide. The dismantling of trade barriers means Cameroon will be losing close to FCFA 100 billion annually. A majority of the imports that EU countries used to pay custom duties for will enter Cameroon duty-free. Senior Economist, Dr. Ariel Ngnetedem, told The Post that the agreement reeks of a negative balance of trade for Cameroon. He holds that while the EU countries will flood Cameroon with their manufactured goods, Cameroon will only be sending mostly raw material that is not even enough. This means that Cameroon will suffer a negative balance of trade in the deal until it increases production of products that it exports to the EU markets. Although countries of the Central African Region were expected to sign the EPA as a bloc, Cameroon went solo and signed an interim agreement with the EU in December 17, 2007. President Biya’s country finally ratified the agreement in 2014, thereby standing alone like a dwarf against 53 industralised countries of the EU. Going by the terms of the economic agreement, Cameroon is opening up its market to the tune of 80 percent for the tariff-free entry of EU goods for a period of 15 years. EU goods that will begin enjoying tariff-free exportation to Cameroon as from August 4 include, industralised machines, Computers, sewing machines, basic goods like drugs, medical equipment and chemicals. There is also a category of products that will only be totally exonerated from custom duty after 15 years. These include, vehicles imported for private use, food products among others. EU goods that will only have duty-free exportation to Cameroon after nine years include trucks for the carrying of goods, tractors, iron products, howling and towing machines among others. In order to protect local industries, Cameroon has negotiated not to allow the duty-free importation of certain products from the EU markets. These include all agricultural and animal products whose products are transformed in Cameroon. Thus, chocolate, jam, soft drinks, mineral water, beef, milk, alcoholic drinks and cigarette amongst others will not have a free access to the Cameroonian market. Other products like paints, cosmetics, savon, matches, aluminium and metal product and cotton products have the same fate. Meanwhile, Cameroonian products have been having duty-free access to the EU markets since 2008 after Cameroon signed the interim agreement. The products that Cameroon exports to the EU markets include, bananas, aluminium, transformed cocoa products, wood, fruits and vegetables. Such products have a value of about FCFA 200 billion a year that represents 15 percent of the country’s exportation to the EU markets since 2008. Explaining why Cameroon signed and ratified the EPA, the Minister of the Economy Planning and Regional Development, Louis Paul Motaze, said it was incumbent on the country to sign the interim agreement for Cameroonian products to continue to have duty-free access to the EU markets, while waiting for the Regional negotiations to be finalised .Given that Cameroon has a diversified economy, he said, it was only logical that the country looks for a bigger market for its products. Such a move, Motaze went on, will help to integrate Cameroon into the EU Community market. The Minster said the fall-outs of EPA are not as many as some observers claim, noting that 20 percent of products have been excluded from liberalisation. He said the accompanying measures of the agreement will be a programme designed to enhance the capacities and the competitiveness of the economies of Central African countries. Meanwhile, eight countries of the Central African Region that are negotiating as one bloc are yet to agree with the EU on a number of issues. For instance, the EU wants these countries to open up their markets up to 80 percent for their goods, but the eight countries are proposing 73 percent in accordance with articles 24 of the World Trade Organisation. Besides, the EU wants the transition period of the agreement to be 15 years, while Central Africa wants 20years. Central Africa also wants the immediate application of the accompanying measures that will assuage the damage that the eight countries will incur due to heavy losses in custom revenue. But the EU holds that, apart from the EU Development Fund, they are no resources allocated for such compensation. Both parties are yet to agree on one of the provision that imposes the respect of human rights, the principle of democracy and the state of laws. These are the issues that Central Africa and the EU have not been able to agree on in 13 years. The EU that has fixed October 1 as the deadline for all negotiations to be concluded says it is ready to come back to the negotiating table for the first time since 2011.